“What is?” projects are thick descriptions, snapshots of learning dynamics, or other detailed analyses of what student learning looks like, or what’s happening during the moments of learning. The size and scope can range from small (e.g., a case study of one student, a thin slice of learning in a single class period) to large (many students [a “large n”], multiple activities occurring over time). “What works?” projects assess the effectiveness of or change caused by an activity, tool, or other intervention. According to the scientific method, a traditional experiment would have two randomly assigned groups: one who receives the intervention and one serving as a control. In SoTL, however, this isn’t always possible. It can be challenging to access two sections of a single course, students are not randomly assigned to courses, and there are so many variables affecting the students’ learning that it’s difficult to design a “clean” experiment. As a result, SoTL researchers attempting comparisons try to use groups that are as similar as possible to measure the effect of an activity as precisely as possible. If the groups are similar, the differences in outcomes are more likely to have arisen from the intervention, rather than from innate differences across groups, but the researchers are always explicit about the specific groups, context, and potential limitations. 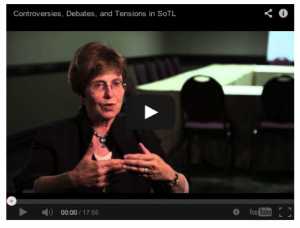 The video below reveals some explorations of the major controversies, debates, and tensions in SoTL. Nancy Chick is an Assistant Director at the Vanderbilt University Center for Teaching. This guide was written by Nancy Chick (Assistant Director, Vanderbilt Center for Teaching). Julie DeVoe (2010-11 Teaching Affiliate, Center for Teaching).